Finally... an oatmeal strong enough for a man, but made for a woman. The box states that this is "a delicious way to give each day a great start - a unique combination of nutrients designed specially for woman." The packaging and promotion of this product cement its position as the Oprah Winfrey of hot cereals. Let's set aside the "For Women" gimmick and compare this to other instant oatmeal products on the market. Male or female, we can all appreciate the increase of calcium to 50% recommended daily allowance from 10% in most of Quaker's other brands. Both sexes can use the added iron, Vitamin D and Vitamin E. Actually, men might better appreciate the Vitamin E as it aids in healthy erections. It's very easy to sell the public on added nutrition if - and this is a very big "if" - taste doesn't suffer as a result. So the big question, how does Quaker Nutrition For Women Vanilla Cinnamon Oatmeal taste? Ho. Hum. It tastes okay. You can taste the vanilla and the hint of cinnamon adds a subtle kick. The texture of the cereal is the same as old favorites like "Apples & Cinnamon" and "Maple & Brown Sugar". It has been said that the best thing you can say about a healthy product is that it doesn't taste like a healthy product. That is definitely the case here. But that's hardly enough to motivate someone down a grocery aisle. $2.49 reflects the price of 12.6 ounce box containing 8 packets. 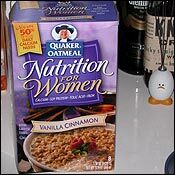 What do you think of Nutrition For Women Vanilla Cinnamon Oatmeal? I have been searching all over for this product. What must we do to get it back!? I miss it. I loved this product. Especially the vanilla cinnamon. Please bring it back! Well, it's almost the end of 2014 and STILL can't find my favorite oatmeal ever. I've about given up looking. Quaker sure messed up discontinuing the vanilla cinnamon oatmeal. I want this product back too. It was great! Please bring back the Nutrition For Women oatmeal. It was great and I miss it. I had this a few years ago and thought it was very, very good. Where can you buy this product? I haven't seen it in any of my local stores for a long, long time. Hey, get with the program! Bring this oatmeal back! I too have been looking for this oatmeal. Come on Quaker - do the right thing. Please bring it back. Obviously many people want it. As I approached my 50's (premenopausal), I figured I should try this product because it had calcium and soy (source of estrogen). I guess I was not in need of extra estrogen as I developed a massive amount of fibroids (excess estrogen encourages fibroid growth) after using this product. Are the two related? I'm not sure. I loved this oatmeal and I am wondering why they took it off the market. Maybe this happened to others. Soy is powerful stuff and I'm not angry about the possible connection. It's my own fault for what I consume. That makes me feel better too. I was addicted to this stuff, and I remember eating it when I was at my healthiest. I have looked for it and never have seen it again. I agree with everyone! This oatmeal was great & delicious. I was looking in all the stores and could not find it. I can't understand why it was removed, maybe not enough sales? Quaker should bring it back, I plan to call/email them too. You can get Kashi vanilla oatmeal which is better for you than Quaker and add cinnamon. That's as close as we are going to get I think. I have an Autistic son and this was the only thing he will eat other than donuts... It really help me get some type of healthy food in his diet. I call Quaker and ask that they bring it back. I guess the more people that call there is a chance to get it back. Ok, so at least I am not alone! I looooove this oatmeal and have searched endlessly to find more online and in stores, with no results... Why the heck would Quaker Oats tease us with this YUMMY oatmeal and then take it away! I am upset!!! It was the only oatmeal I liked and now it's gone. I thought I was going crazy, I also love it and can not find it. I went to every grocery store in a 5 - 6 mile radius and am now looking online. I would like to purchase Women Health Oatmeal I live in St. Albans WV, Is a store near there I can purchase this? I liked the product as well. The last time I bought this was at Big Lots 3 years ago and never saw it again. Seems like they also discontinued the Simple Harvest line which I also loved. These were much better than the new True Delights line... Hazlenut Latte and Wild Blueberry Muffin. When there are SO MANY people wanting this cereal... WHY CAN YOU NOT BRING BACK TO GROCERY STORES?? Best oatmeal ever... can't find it anywhere anymore. This is a sad sad day! I am so glad I'm not the only one looking and inquiring about this product. My opinion... THIS WAS THE BEST OATMEAL EVERY MADE. PLEASE BRING IT BACK! By Lady B. PLEASE HELP! I can't believe that I have been unable to find Vanilla Cinnamon Nutrition for Women Oatmeal any where from coast to coast. My mother has suffered from Alzheimer's disease and one of the highlight of her day is the breakfast of this delicious and healthy cereal. After reading all of the comments I have concluded that this cereal is no longer available. PLEASE, Quaker, Bring it back!! There are obviously a lot of people who feel as strongly about it as I do. I too loved this product. I can't believe it's gone. I still walk by every oatmeal isle in hope that it will be sitting on shelf! Please Quaker, bring it back. So many of us miss it. Best oatmeal ever. I like this one the best, can't find it anymore in Pittsburg, CA. I didn't like oatmeal as an adult until I tried this one. Get a grip you silly (people), go buy some regular oatmeal, add some vanilla extract and some powder cinnamon. Spending 24 dollars plus shipping for oats, (darn) crazies. Our Big-Y in Monroe, CT stopped selling it!!! I used to buy it all the time. Anyway; it's my favorite Oatmeal (I like to add some instant plain oats to it). I love the vanilla cinnamon, too, but can't find it in Edmond, OK. Would love to know where I can buy it without going online. I LOVE this!!! Can't find it in Atlanta but found some in Harris Teeter in Nashville. Amazon has it for $23.59 ... don't love it THAT much ... so let's petition our stores to carry it. Anyone had any luck? The best i've ever tasted!! It taste great & helped me to lose wight, and it's very healthy! WHERE CAN I FIND IT? How can something so... good not be found or sold? I just noticed that it has been a year since I last posted to this subject and at that time I was again looking for this wonderful product from Quaker and found it labeled with new packaging and name. Now, it has disappeared from Harris Teeter''s shelves and I am so disappointed in Quaker. Surely they aren''t losing that much money on this product; could it be the marketing and merchandising. What do we need to do to keep this product on the shelves. Not only do I love the taste, but I depend on the nutrition benefits. After our local store stopped carrying it I found it on vacation. My husband travels there once a month and picks it up for me, two hours away! That store no longer carries it. I am emailing the company. I love this too... we need it back, I can't find it either. I've been looking for Vanilla Cinnamon Oatmeal in the cereal aisle; it's gone. Love the subtle taste vs. the Maple & Brown Sugar. Yes, it lowers cholesterol; 13 pts. in 2 weeks. What happened to it? Does anyone know? I tried to get it online but it's expensive that way... it's $5 plus shipping. Please bring this back! We should all contact Quaker on their website. I just emailed them. The only place I've been able to find it is at SuperTarget. Where can I find it in Maryland?? No stores carry it anymore! It's the BEST!!! I can't locate nutrition for Women Oatmeal anywhere. Have product been discontinued, if not where can I buy it? I agree... it is my favorite too and can't find it. BRING MY OATMEAL BACK!!! I hate oatmeal. Like alot of other people have commented, I would try to eat it, because I knew it was good for me, but I couldn't stand the taste/texture etc. of most flavors of oatmeal. I actually find myself craving this - and like most others, it is next to impossible to find this at most stores. I am stocking up in case they discontinue it!! I had the same problem so I emailed the Quaker Oats Company and they assured me that they still make it. If you can't find it in stores, you can order it from hometownfavorites.com. Enjoy! I cant find it anymore either, wegmans stopped carrying in and I am about to go order it online! It is the best oatmeal I have had so far. Same story, I used to buy it at my local wegmans...and now I can''t find it anymore! I wonder if quaker oatmeal is reading these comments. They need to start selling it again! Quaker Oatmeal Nutrition for Women Vanilla Cinnamon was my favorite breakfast food. It also provided a very good source of iron in my diet. Since I have been unable to find this product, I now find that I am anemic and have to take iron supplements. I would love to be able to find this product back on the grocery shelves. This is now one of my favorite foods! Wow oatmeal a favorite food ! Stop and Shop in my town has stopped carrying it - I ate it every day and absolutely loved it! Vanilla/cinnamon is delicious. I love this product - I've never been able to eat oatmeal but knew that it was healthy for me so I would keep trying different types - this is that only type and flavor that I can eat!! Please someone, do you know where we can buy this? I can't find it anywhere either! I love the product! Can you order this online somewhere? I can't find it anymore. I can't find this either and believe me, I've searched! I too have been recently told that I have "moderate osteoporosis" and I'll be 44 this month! I believe I can attibute it to an anti-seizure medication that I take for my chronic migraines, but trying to get all of my calcium intake would be helpful with products like this, but everyone seems to have stopped selling it! I am a 53 year young female that was diagnosed with serious osteoporosis 2 years ago. It came as a complete surprise to my doctor and me as I am very active and try to work out at the gym four times a week. I absolutely love this oatmeal and have never liked oatmeal. My cholesterol came down once I started eating and the benefits I receive from the 50% calcium intake is so helpful since I need to take in 1800 mg a day. My grocery store stopped carrying this brand, Walmart, Kmart stopped, but I did find it in Harris Teeter. Thank you Harris Teeter! and Quaker for stepping up to our health needs. AGREE----My favorite can't find anywhere!!! Its my favorite and I can not find it anymore either! This product is really good. Too bad I can't find it in the stores anymore.